I may have mentioned this before, but we’ve been blessed with more tomatoes from our garden than we know what to do with. We’ve made jars and jars of tomato sauce and ginger tomato dressing. We’ve eaten tomato sandwiches. We are definitely about tomatoed out! But, we still have tons left to preserve or consume. So this weekend, I whipped up a quick and tasty Tomato, Chickpea and Feta Salad that I found in the latest issue of Fine Cooking, which just happened to have an entire section devoted to ten-minute tomato recipes. Though we had to search for za’atar (we found it at the Middle Eastern grocery store near our house on the corner of Lake and Anthony), a spice blend treasured for its savory thyme-oregano flavor, the recipe, overall, is very simple, and very tasty—a perfect snack for these last days of summer. Mix crumbled feta, 2 tsp. za’atar, and a pinch of crushed red pepper flakes in a small bowl. Add 1 Tbs. olive oil and let sit. Place tomatoes in a large bowl. 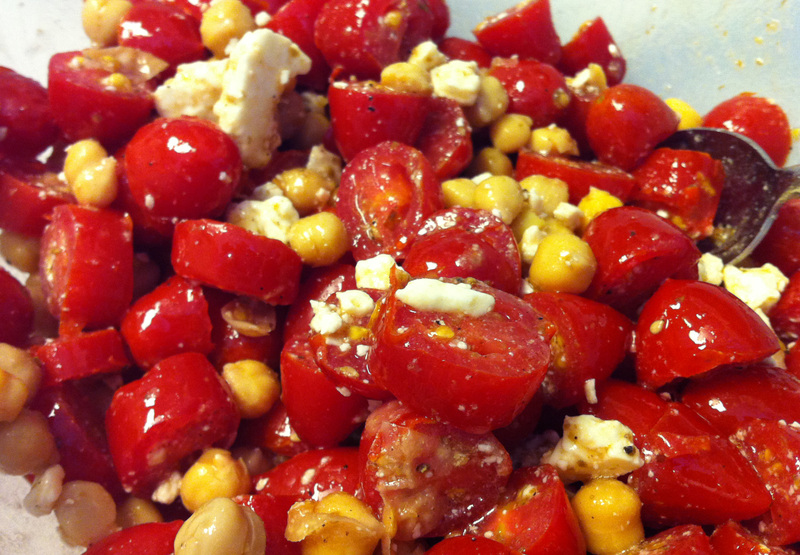 Rinse and pat dry the chickpeas and add them to the tomatoes. Season with 1/4 tsp. salt and a few grinds of black pepper. Add 2 Tbs. olive oil and 1 Tbs. white wine vinegar. Stir in feta, season to taste with salt and pepper, and serve. This looks really good, and while we don’t have a ton of tomatoes I am currently infatuated with chick peas! I, too, am obsessed with chick peas lately- love the texture, the taste… everything!